Just finished today's update, and after scheduling, I thought I'd check the site stats real quick to see how we're doing. 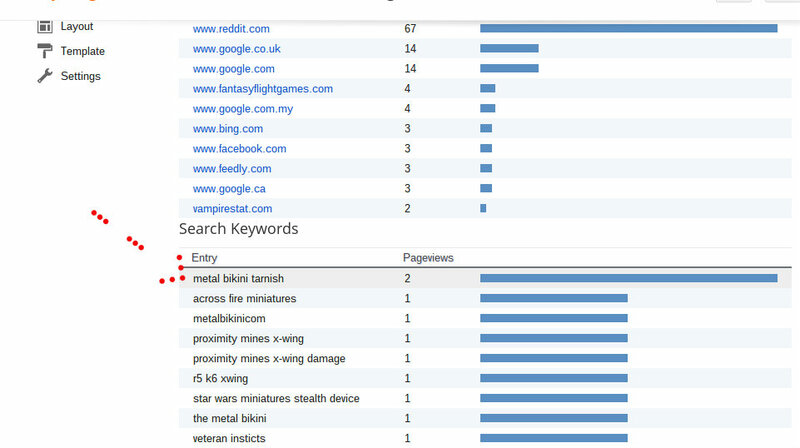 In that same screen, I see the search terms people type into Google and Bing and whatever that lead them here to TheMetalBikini.com. 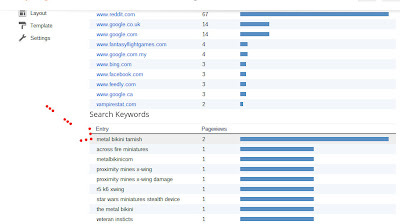 Generally, well actually up until now, always, they've been X-Wing Miniatures type terms, which of course makes sense if you think about it- you the Googler aren't likely to be fooled by a somewhat disassociated domain name from what this site's actually about. Caught me off guard, made me LOL a bit, so I thought I'd share. The punchline here of course being that it generated 2 pageviews. 2. Like this guy was all, "Ok, cool- oh wait, that's not the metal bikini tarnish info I was seeking. Wait though, what was that? Let me go back." I'll work on it when we get done with Wave 2. Bikini Battle Basics- The Damage Deck Explained!